The North Star, Polaris, is the fixed point in the night sky. The subject of mythology, legend, and lore, it is the pole star that doesn't appear to move -- the guiding star on land and sea in the northern hemisphere. The North Star doesn't appear to move because Earth's axis of rotation points almost directly to it. Ship's navigators called it "The Mariner's Star" (Stella Maris), the Navajo referred to it as "The Fire Star," the Pawnee saw "The Chief Star" in the night's sky, and Polaris is the "Lodestar" of poetry. We can find Polaris at the end of the handle in the Little Dipper (or the Drinking Gourd) and in the tail of Ursa Minor (Little Bear) as we look up at the stars on a clear night. 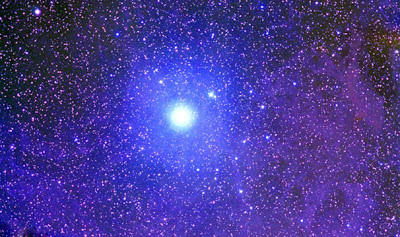 The magnitude of Polaris is 1.97, so it's the brightest part of the constellation. While the word 'Polaris' is Latin for "pole star," the Greek called the star Cynosura, which means "tail of the dog." In the 1800's, the route to Westerville, Ohio was a plank road, heading north, out of Columbus and tavern keeper and stagecoach owner, George Stoner, smuggled runaway slaves into Westerville on that very route. Westerville, Ohio was a refuge along the Underground Railroad. Once in Westerville, a collaboration of residents helped runaway slaves find their way to Alum Creek and then points north to Marengo, Ohio, to the protection of Quakers and a free black community, to then continue further north to freedom. The Hanby Family was one of many families in Westerville actively involved in the Underground Railroad. (If you visit Hanby House, ask about the white vase in the window.) About a mile away from the Hanby home, on what is now Africa Road, another family active in the Underground Railroad, The Sharp Family, built their home directly under the North Star as a guidepost to runaway slaves. Africa Road and Polaris are now becoming auspicious symbols of progress and benchmark development for modern-day Westerville and its future through the Westar Center of Business. The North Star is a constant, guiding light in the night sky that represents hope, stability, safety, and our pebble-in-a-pond interconnection. I chose to reference the North Star in the name of my pet care business to reflect the star's symbolism and significant role in my community. I chose the North Star for one more reason, if you are in the northern hemisphere while you are away and look into the night sky to find the North Star, you'll see the one star that shines over both you, wherever you may be, and your pets, who are safe at home. By the way, when you look in the night sky - stars twinkle, planets shine.